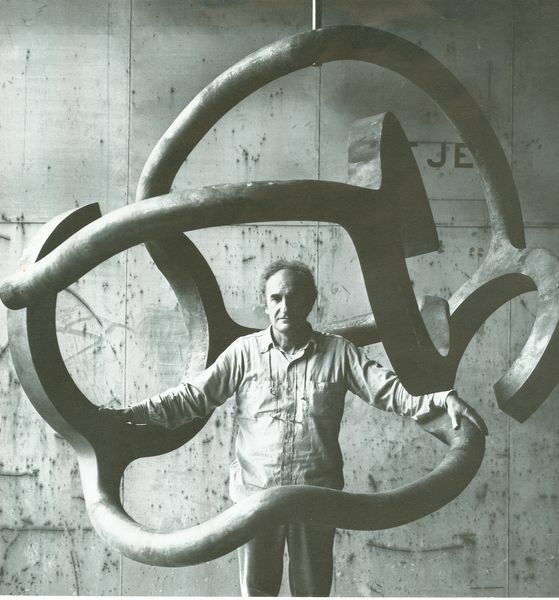 Chillida was born in San Sebastian, Spain in 1924. He conducted preliminary studies to enroll in architecture at the University of Madrid before turning his attention to drawing which he studied at Círculo de Bellas Artes in Madrid. 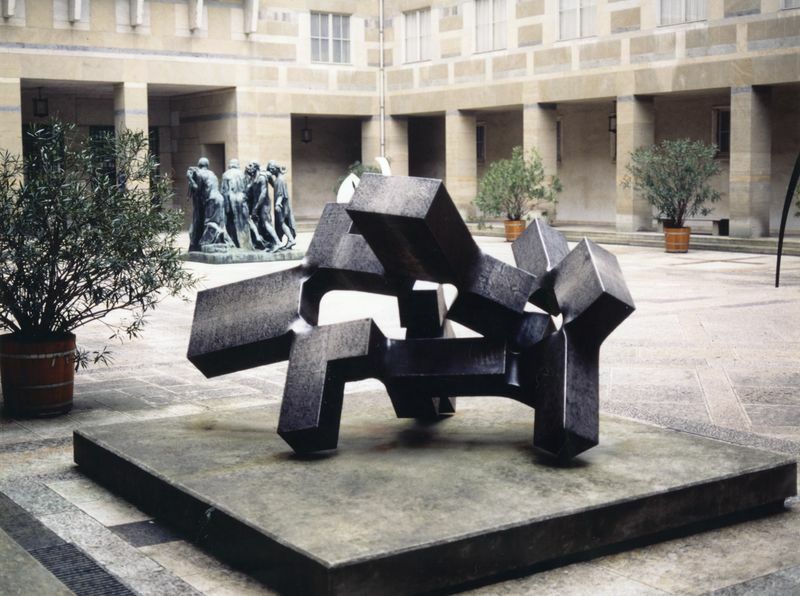 In 1948 Chillida was awarded a scholarship to attend the Cité Internationale Universitaire and travelled to Paris. On his return to Spain in 1951, he began experimenting in materials that resonated with the Basque region’s industrial heritage such as iron, wood and steel. 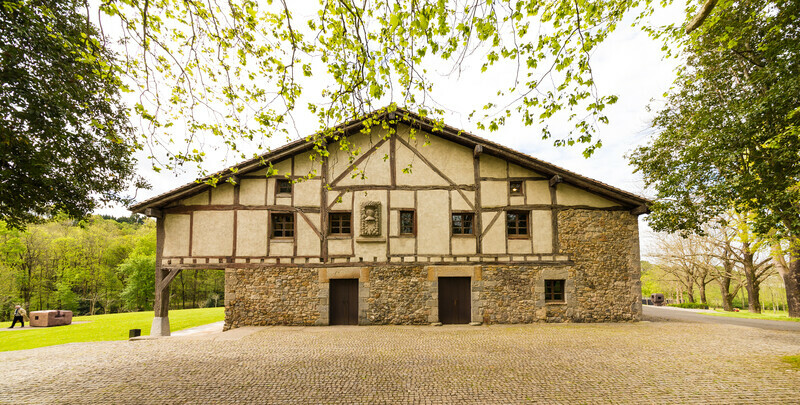 Chillida settled in Hernani and, in 1952, he set up an iron foundry, learning techniques from a local blacksmith. During this period he continued to make engravings and collages and this core practice was to continue throughout his career, allowing him to explore form and line by cutting into paper. 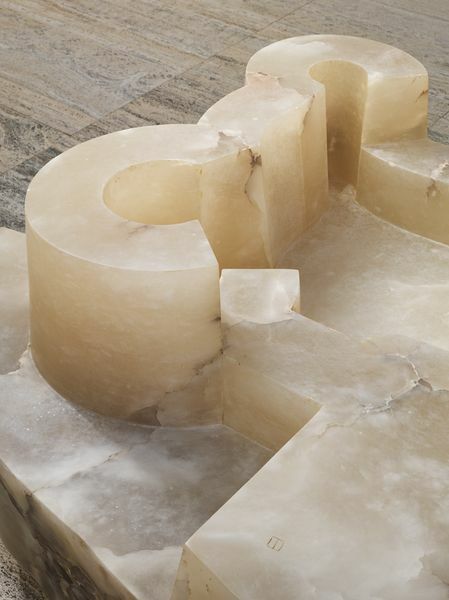 This technique arose from the concept of the collage in the mid 1980s (gravitations did not replace collages) by a new development, ‘Gravitaciones’ (Gravitations), in which Chillida eliminated the adhesive from his collage, allowing the work to be suspended in space. 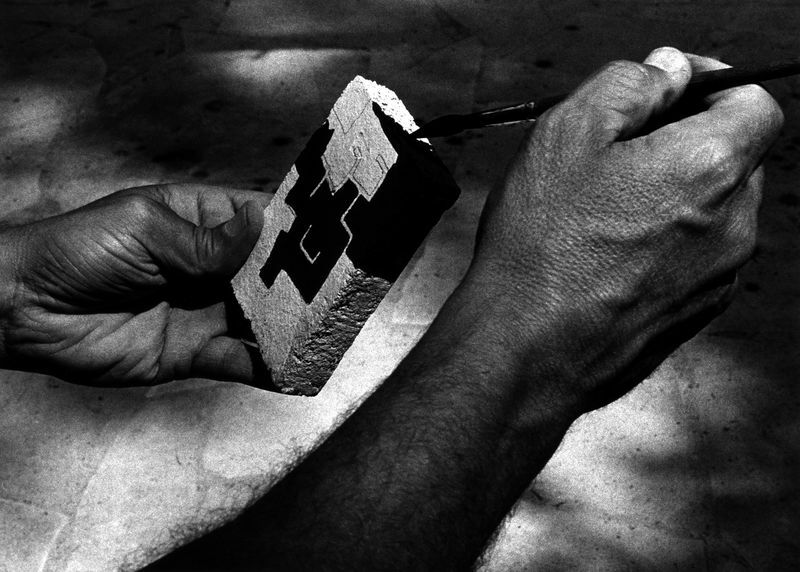 Patiño Pérez, Antón, ‘Eduardo Chillida : vida e filosofia. Ourense, Diputación Provincial de Ourense, 2003. 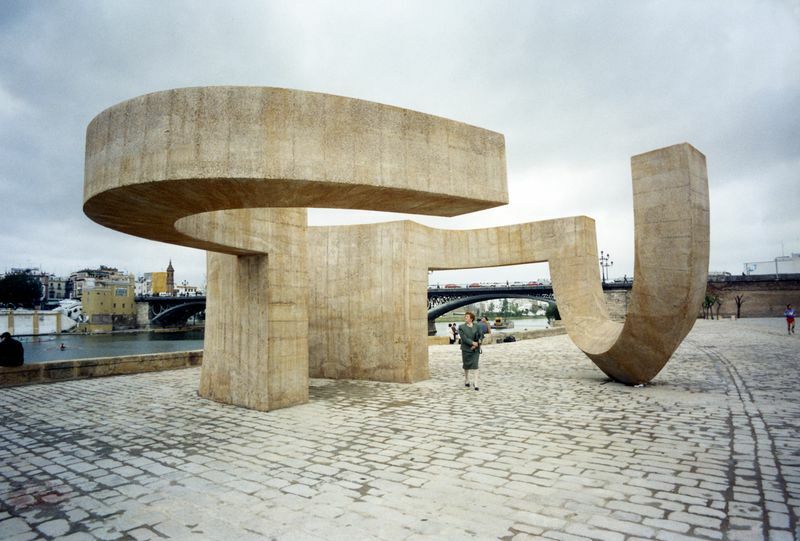 Finn, David, ‘Eduardo Chillida’ Barcelona: Polígrafa, 1999. 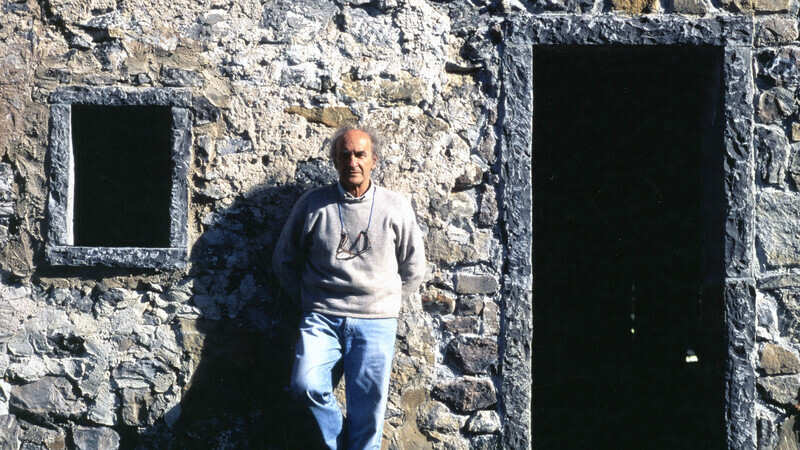 Chillida, Balerdi, Larrea. Lisboa, Fundaçao Calouste Gulbenkian, Centro de Arte Moderna José de Azeredo Perdigao, D.L. 1995. Figuerola-Ferretti Pena, Luis, El arte en Madrid" en Goya, nº 157, Madrid, julio-agosto 1980, p. 38-39. Gaya Nuño, Juan Antonio, ‘Chillida, escultor en hierro caliente’, in: Insula, nº 123, Madrid, February 1957. 2019 Hermoso, Borja, ‘Chillida Leku. regreso a la casa del padre’, in: El País, Madrid, no. 2.218, 31 March 2019, pp. cover, 28-37, ill.
Espinosa de los Monteros, Patricia, Fabián, Beatriz, 'Chillida Leku Reabre al Publico. El Caserío Vuelve a Hablar', in: Elle Decor, Madrid, April 2019, pp. 49-54, ill.
Alvares, Rosa, 'Retorno a Hernani', in: Harper's Baazar Spain, Madrid, April 2019, pp. 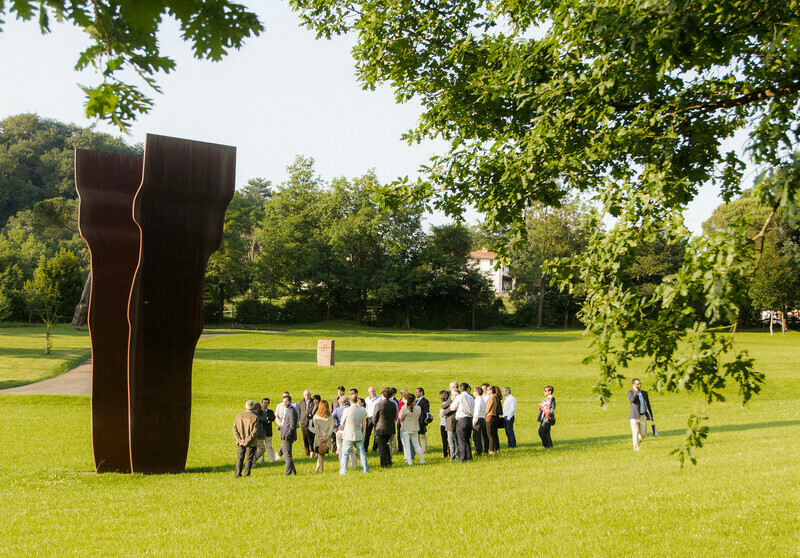 82-84, ill.
Piejko, Jennifer, ‘Eduardo Chillida en Hauser & Wirth, Zurich’, on: www.solarmag.es, 27 February 2019, ill.
McGivern, Hannah, ‘Eduardo Chillida’s Basque museum and sculpture park announces full reopening’, on: www.theartnewspaper.com, London, 21 February 2019, ill.
Ormazabal, Mikel, ‘El museo Chillida-Leku se reabrirá al público en abril de aste año, in: El Pais, Madrid, 10 January 2019, ill.
Villardón, María, ‘Así son Manuela e Iwan Wirth. la poderosa pareja del arte que dará una nueva vida al Chillida-Leku’, on: www.okdiario.com, Madrid, 29 January 2019, ill.
Use this document to record bibliographic entries that need to be sent through Asana. en Fitur’, in: Diario Vasco, San Sebastián, 24 January 2019, ill.
Vanguardia, Madrid, 10 January 2019, ill.
___, ‘El Chillida-Leku reabre sus puertas en abril’, in: La Opinion, Madrid, 10 January 2019, ill.
Moyano, Alberto, ‘Chillida-Leku reabrirá en abril’, in: Hoy, Malaga, 10 January 2019, ill.
Pajares, G., ‘Chillida Vive’, in: La Razon, Madrid, 10 January 2019, ill.
Vasco, San Sebastián, 10 January 2019, ill.
Basque Country, 10 January 2019, ill.
Vasco, San Sebastián, 14 December 2018, ill.
Berner, Irmgard, ‘Formbar im Widertand’, in: Weltkunst, Hamburg, December 2018, pp. 60-61, ill.
___, '2018 West Bund Art & Design', on: www.ftchinese.com, Beijing, 7 November 2018, ill.
CansART, 'Just opened Shanghai West Coast Expo must-see gallery and Asian artists', on: www.cansart.com, Taipei, 7 November 2018, ill.